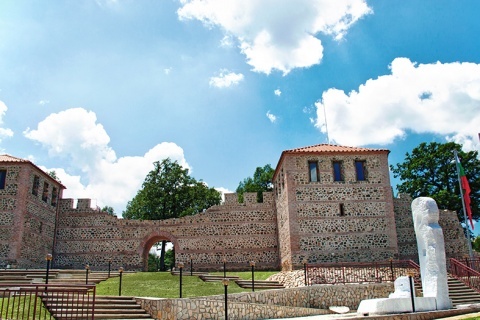 The first fully restored Roman fortress in Bulgaria in the village of Belchin near the mountain town of Samokov opened doors for visitors Saturday. There was a reenactment of a battle between proto-Bulgarian soldiers and Roman legions. The construction of the fortress has started during the rule of Emperor Valentinian I in the 4th century AD. The location has been selected because it is strategic and allows monitoring of the entire valley and protection of its western side. The settlement itself is also related to the mineral springs, the deposits of magnetite sand and the strategic junction of two ancient roads. Until recently, the fortress has never been used by the Bulgarian State. Several years ago, archaeological excavations revealed that it was huge and covered an area of over 14 decares. The EU funded the restoration project with BGN 5.5 M.
The project included the rebuilding of the fortress walls, and the construction of a museum and a church. There is also a lift from the village to the site.